Eh, well, to our house at least. I still consider Illinois/Indiana home! I will blog about the train trip once I recover enough and get all the pictures on my computer. I will say all things considered, it was a good trip- Shaun and I were both sick though which did not make for the easiest travel, but we survived. I always have a hard time when we come back from visiting family, our house seems so empty, but I have been trying to keep busy to keep my mind off it. Thankfully, Shaun has no troubles keeping me distracted! It pours, all over my bathroom!! Oh yes. We came home and turned the heat on, a few hours later, I walked into the bathroom to find a wet bathroom and water dripping from the vent. Oh boy! I called maintenance and they said it was a broken condensation pipe or something like that. The good news was there wasn't a lot of damage since we'd caught it so soon (thank God I had turned the heat off before we left!). The bad news, they had to call in an outside contractor to fix it and we're not sure how long before they can come. In the meantime, we're without heat, and I don't know if I've mentioned this before but I get cold VERY easily. 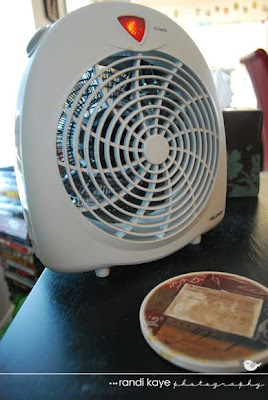 They let us borrow these two itty bitty space heaters (all they had! ), but when I tried plugging both in, we lost power in the living room. And so we just deal...and wear layers!! 3. My guest bedroom: opinions? I came home to find the bedding I'd ordered for the guest room had arrived! And it is even more gorgeous than I'd imagined! (If I didn't think Matt would think it was a bit too girly, I'd use it in our bedroom instead.) 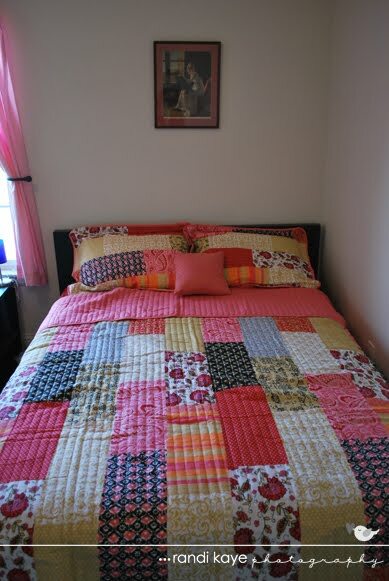 I'd already had pink curtains and a set of red sheets so when I saw this bedding I thought it would work perfectly without having to replace either. 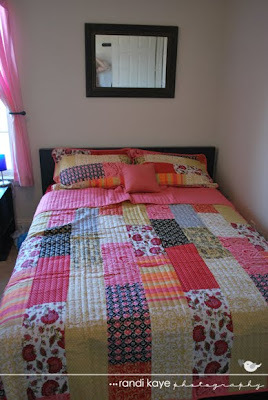 It is still a work in progress, so I'll only post pictures of the bed at the moment to ask for opinions. 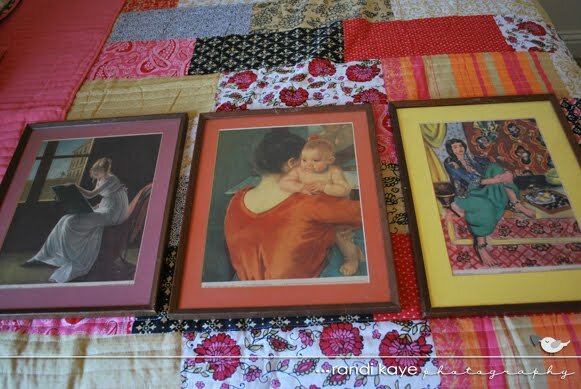 I *think* I already have decided that the mirror above the bed looks best, but I have these wonderful art prints I would love to put up and the guest bedroom is the only place they'll work, perhaps put them elsewhere in the room? What do you think? A little back story on these prints, they were given to me by my Great Great Uncle Theodore. If you follow my blog, you might remember that I recently learned he had passed, we were very close so these also have a lot of sentimental value. Not to mention historical value. They are from the 1937 National Committee for Art Appreciation! You can read about that here. 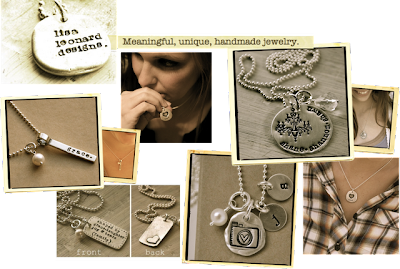 Who doesn't love a good giveaway, and this is a great one for a Lisa Leonard gift certificate- beautiful custom jewelry, I browsed the site and fell in love with pretty much everything. So head over to lowercase letters to win!! Does Grand Champion for 4H count? If so, then yes- for Creative Writing. Yes! I cannot stand unpainted toenails! Right now they are blue!! The afore mentioned itty bitty space heater! I prefer soft, but I am not so great at cookies so mine usually end up a bit more crunchy...but as long as they taste good, right? Love the bedding and I liked the mirror above it best! Sorry to hear about all of the water. Hope you have a happy Monday. I hopped over from Carissa's! Just hopping by via MMOM. Love the bedspread, great colours. If you have a few minutes spare please pop by and see me.